Those among us who are older remember Yvonne Trueb as the constant face of the IAAP. 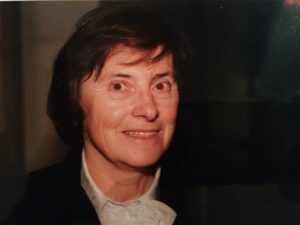 She served the association faithfully from 1976 – 2013 and kept the offices in Zurich functioning, collected dues, updated the membership database, and helped organize the 1995 IAAP Congress in Zurich. But she did much more: with her quick alert mind, she was fully informed about what was going on in the IAAP – for a long time one could say she was its “memory”. She had the overview about the structure, and knew about special situations of colleagues. Gifted in languages and interested in the functioning of the IAAP, she did a great job – on her own – but always in a prompt correspondence with the officers. Industrious she continued her work far past the normal age for retirement. She was of great helpfulness. Modest as she was, only few people knew about her important work at the Balzan Foundation. She was very fond of her daughter, her son and the great children – and she loved Stromboli. The last two years have been rather difficult due to illness and increasing dementia – she died August 2, 2018. We will remember Yvonne with gratitude and deep respect.